Glen Canyon National Recreation Area, established in 1972, provides a dramatic example of one of nature's most inspiring settings, combined with a monumentally ambitious human project. Impounded behind the Bureau of Reclamation's Glen Canyon Dam, waters of the Colorado River and tributaries are backed up almost 186 miles, forming Lake Powell. The lake has 1,986 miles of shoreline, and by the time the dam was completed in 1963, it took another 14 years to fill the lake. Since then, Lake Powell has proven to be a premier attraction for millions of visitors from all over the world. Glen Canyon National Recreation Area comprises more than a million acres in southern Utah and northern Arizona surrounding Lake Powell. Glen Canyon National Recreation Area is open year-round. The highest visitation is in the summer season. In the winter months, Glen Canyon's visitor centers and Lake Powell's marinas have reduced services. 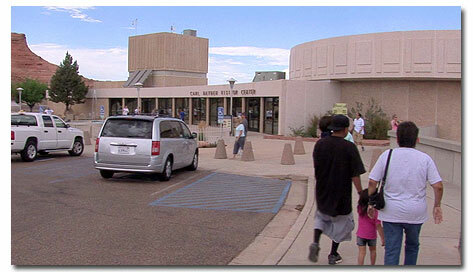 Carl Hayden Visitor Center, Page, AZ, daily, Memorial Day - Labor Day, 8 a.m. to 6 p.m.; daily, November through February, 8:30 a.m. to 4:30 p.m., rest of year, daily, 8 a.m. to 5 p.m.; closed Thanksgiving, Christmas, and New Years Day. 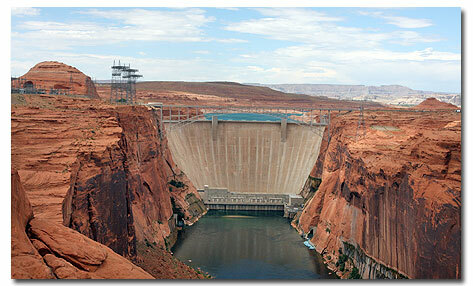 Attractions: Free tours of the dam, exhibits, video shows, a relief map of the entire Glen Canyon area. Restrooms and a bookstore. Potential Junior Rangers are invited to come earn a badge.New dinosaur exhibit at the Carl Hayden Visitor Center! The National Park Service and Bureau of Reclamation bring you the Museum of Northern Arizona's Therizinosaur: the Mystery of the Sickle-Claw Dinosaur exhibit, on display for a year beginning March 2011. Navajo Bridge Interpretive Center, near Lees Ferry, daily mid-April - October, 9 a.m. to 5 p.m.; weekends only, early April and November, 10 a.m. to 4 p.m. Attractions: Bookstore, outdoor exhibits, and self guided walks across the historic Navajo Bridge. This is a popular spot to look for a California Condor. The Glen Canyon Natural History Association operates park bookstores. Regularly scheduled ranger programs are available seasonally. Call the park for specific dates and times of special events. Visitor Centers and other public buildings within the recreation area are accessible. Concession facilities are accessible. Shuttle vans are available at Wahweap, Bullfrog, Halls Crossing and Hite. A medical clinic, staffed by a Physician's Assistant, is open in Bullfrog from approximately May 15 to October 1. The Boater's Guide & Map Intro. 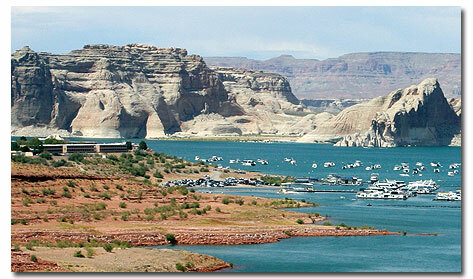 Package to Lake Powell includes detailed information, maps and black and white photographs of Lake Powell. Click here to review. Lake Mead Guide & Map Intro. Package -Click here to review.